On September 2-3, 2017 the forth TOMODACHI Alumni Disaster Resilience Training Program: Tokyo Workshop took place in Shinjuku, Tokyo. Eleven alumni from across Japan joined the workshop focused on Disaster Preparedness and Leadership Training (Day 1) and Volunteer activities for Disaster Risk Reduction (Day 2). The Tokyo Workshop focused on training the trainer to have alumni teach disaster preparedness and awareness to even younger generations as our college-aged alumni were taught how to and then trained elementary school aged students at the Shinjuku Bosai Festa. This training was implemented in partnership with Peace Boat Disaster Relief Volunteer Center. On the first day, alumni received training on bosai maps, situational preparedness, presentations on past disasters and other learning activities. With a bosai map of all the relevant spots during a disaster, the group took a walk around the neighborhood of Shinjuku to make sure they know what to look out for (i.e., water spots, schools to evacuate to). Alumni also took part in the Crossroads Game, a disaster preparedness exercise which helps the participant see that there is no right answer but different ways to see a situation by changing your point of view and has the participant experience the moral dilemmas that every situation can bring. Two alumni, Kei Imai and Miki Akeshita, who took part in the Kyusyu volunteering efforts after the floods, presented their experiences volunteering in the region to other alumni. The alumni also discussed and practiced how they would teach the younger generations about disaster preparedness through games the next day. On the second day, the alumni participated in the Shinjuku Bosai Festa in Toyama Metropolitan Park as volunteers to pass on their knowledge of disaster preparedness and awareness to over 3,000 visitors, of which 700 were children. 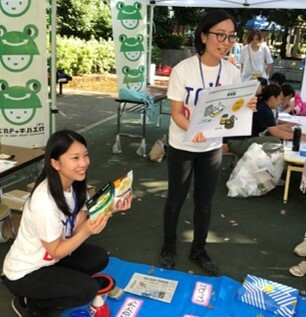 Through the children-based program “KAERU CARAVAN”, alumni took part in teaching visitors about disaster preparedness through games and quizzes. Creative methods include memorization game with 12 items every household should have to prepare themselves for the next disaster (ie. water, flashlight, saran wrap, etc. ), and an origami corner where that taught kids how to create cups and bowls with paper and saran wrap they can use if all of their plates are broken or damaged after a disaster. 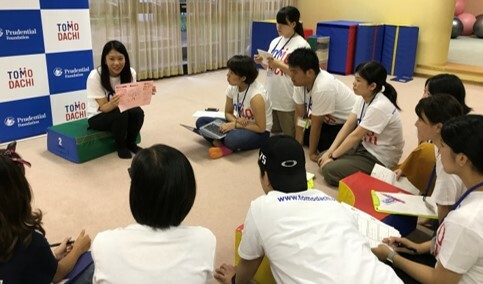 The TOMODACHI Alumni Disaster Resilience Training Program: Tokyo Workshop provided alumni a hands-on training through both service learning and facilitated training. Taking place in Shinjuku, Tokyo, added an exceptional value to the program as a large earthquake is projected to hit the region. The Workshop fulfilled the goal of the program to endow TOMODACHI Alumni with knowledge and experience of disaster preparedness; to prepare students willing to volunteer in disaster situations; and to give an opportunity to connect with one another. This program is made possible by the generous sponsorship by Prudential Foundation.